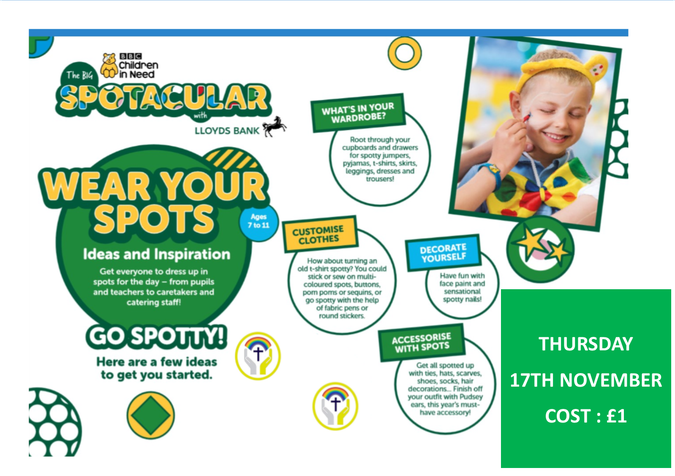 On Thursday 17th November we will be having a non-uniform day to raise money for Children In Need and NSPCC. Foundation Stage and Key Stage One children can dress up as their favourite superhero. Key Stage Two children can wear something spotty. Participation is purely voluntary but if you would like to support the charities please send a donation of £1. Children in Need goodies will also be on sale at the office from 16th November. Please remember the children will be playing out and taking part in lessons as usual so will need to wear sensible shoes and a coat.